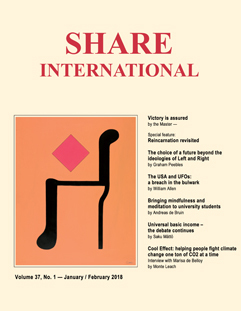 Since the inception of Share International magazine, Benjamin Creme’s Master has provided articles to be published not only at the time they were written, but also whenever appropriate according to world circumstances. Indeed, many of these articles seem more relevant now than when they were first published. This article first appeared in the July/August 1996 issue of Share International and now, more than ever, we are called on to make our choice for a safer, saner world for all. Since we cannot know all that is involved in Maitreya’s judgement about His fuller Emergence we would be wise to trust His skill in action. It is near the time for mankind’s great decision. Expectant, the Lords Themselves await that decisive moment. Few there are, indeed, among the multitudes who know the importance of this time, the choice for man: to plunge headlong, unheeding, to disaster; or to reorder, and sanctify with justice and freedom, the life for all men. It is, of course, a perennial choice, focused now as never before. Never before has so much depended on the rightness of man’s decision, for today, in man’s hands, lies a weapon of uncontrollable power to destroy. Great, therefore, is the need for calm and careful thought. To enable men to understand the consequences of their actions, Maitreya stands ready to enter the public sphere. He will add His persuasive wisdom to the call for sanity and peace. He will inspire and teach. In growing numbers, men will emulate His actions and manner, and, in time, the world will follow His wise counsel and restore to men their birthright of peace. Thus will it be. Thus will Maitreya fulfil His promise and His duty to mankind. With impatience do many await this time, knowing little of the many factors, cosmic and other, which must be balanced by Maitreya to fulfil the law. Nothing may be done which infringes the free will of men; naught but the Law, and an understanding of the times, can influence the judgement of Maitreya on the moment of His public appearance. Of one thing you may be assured: not one moment’s delay will be countenanced by Maitreya which would, otherwise, allow His open mission of service to begin. He alone is the arbiter of that moment. Await, and trust, His judgement. That judgement rests on knowledge unknown to men. A cosmic grasp alone permits its correct assessment. Even so, Maitreya must make weighty decisions on slender – and changing – data. A fine line, indeed, divides the necessary and the possible. Trust then the skill in action of the Lord of Love. Chafe not at the seeming delay of His appearance – in the all-embracing Now no such delay exists. Ere long, the Son of Man will assume His rightful place as the Teacher of mankind. Gladly and willingly, the majority of men will follow His advice and take to heart His teachings. Step by grateful step, will they set in place the structures of the future, and, in gathering momentum, the old mistakes will die away, forgiven and forgotten. Thus will it be. Thus will the Great Lord and leader of men fulfil His destiny, and thus will mankind know true joy. This article, written in 1983, may have been intended as a call at that time to the many new age groups which had been approached by Benjamin Creme and co-workers, from 1974 onwards, to encourage co-operation. A response was generally sadly absent. We re-print ‘The need for synthesis’ here as part of our current focus on the requirements for effective and unified group work; it could prompt honest self-reflection within all groups. It certainly points to the need to explore ways to “link arms across a sea of differences and to embrace as equals those with whom you disagree”, as Benjamin Creme’s Master puts it. It is strange that, despite the lip-service paid to the ideas of unity and brotherly love, so few of the groups involved with New Age concepts do in reality demonstrate an inclusive attitude. Far from doing so, they tend rather in the opposite direction and are among the most separative and exclusive of all the groups engaged in the education of mankind. Their role is to hold before the peoples the vision of a better world in which separatism has no place, in which each is seen as contributing something essential to the Whole and of equal value. Yet, almost everywhere, the accent is on the superiority of a particular teaching or point of view. Rare indeed is it to find the actions of co-operation and mutual understanding which hold so proud a place in their vocabulary. An ancient rhythm still dominates the thinking of these groups, and much needs to be learned and changed if they would truly represent the ideals of the coming time. That such changes will come is inevitable but for many the process will be difficult and long. Many see the need but cannot find within themselves the ability to relate to others on equal terms, so deeply ingrained is the habit of competition and exclusiveness. Furthermore, for some, the need to be seen as leaders of thought is a dominant factor; with them, the glamour of personal ambition has a powerful hold. Such is the situation today, yet the need is for a growing sense of identity with one another, an apprehension of the underlying synthesis which unites the endeavours of all such groups. Moreover, it is only when that synthesis is grasped and presented to the general public that the educational role of these groups can be fulfilled. At the moment, the average seeker is confused and baffled by the competing claims for his attention and allegiance. Soon, the world will know that the many teachings and formulations of truth stem from one source; that the same divine stimulus flows through all; that the varied interpretations result from the fact that mankind has diverse needs and stands at many stages on the ladder of ascent. Not for nothing has Hierarchy worked to present the needed teachings and ideas on the broadest front, on many different levels and in a multitude of ways. When men see the Christ and His Disciples, the Masters of Wisdom, they will come to understand how needed are the many presentations of truth, for they will come to realize how old is man, how varied his experience and expectations down the ages, and how different are the ways in which men absorb ideas. They will come to grasp, too, something of the inherent unity behind the outer diversity. Men will see for themselves that behind the ideas and teachings stands a Plan; that every teaching is the formulation of but one fragment of the Plan; that the Plan is the expression of the creative Will of God and as such is in process of constant change. How then could one group, society, or institution embody the Truth for all time? Many, of course, believe that even now they work for synthesis and unity, but this is largely an illusion. Little credit should be taken for forming links with those of like mind; that is useful but relatively simple. More difficult is it by far to link arms across a sea of differences and to embrace as equals those with whom you disagree. Seek that which unites in your brother’s presentation. Know that behind all stands the Christ and His Disciples. Remember that the one Truth informs all approaches and that naught divides but the minds of men. Dear Editor, One day at the beginning of May 2018 a group member and I were in Amsterdam waiting to cross at a pedestrian crossing. A Moroccan-looking man had already crossed the road towards us and as he was passing he suddenly turned and started to talk to us. It startled me a bit. He appeared cheerful and happy. We do not remember precisely what he said, but what it came down to was: he never felt lonely because he talks to people; he helps people wherever they are and with whatever is needed, because we are all one, brothers and sisters. He then went his way and we, feeling lighthearted, crossed the road, as the light had turned green. Co-workers, Share Nederland Information Centre, Amsterdam, the Netherlands. Dear Editor, On 10 May 2018 we had organized a lecture in The Rose (de Roos) spiritual centre in Amsterdam; the title was ‘The Beauty of Existence and the Laws of Life’. Very soon after we arrived at the lecture room, on the third floor (up some steep stairs), to our surprise a lady on crutches came in. Why we were surprised is because she had left the tram at the same stop as we had and there’s some distance to walk to get to the Centre, and then up the stairs. She must have made the walk to the centre and up the stairs at a remarkable pace. At the end of the lecture we talked about Declaration Day and that Maitreya will give humanity an experience of unity. At which point the lady told us of a spiritual experience she had when she looked at a beautiful painting of Maitreya that a friend of hers in Moscow, a painter like herself, had made – His eyes were beautiful, like light and radiating light. We also talked about the Masters working through disciples and she said that it would be wonderful to know the Master who worked through Benjamin Creme, and Rembrandt, for example. She then said that she had to leave because she wanted to attend something else. Transmission Meditation group members, Amsterdam, the Netherlands. Dear Editor, (1) In 1995, I was taking piano lessons at a music school in Rimouski, Canada. In November or December 1995, my teacher asked me to participate in a small recital at a residence for people suffering from cancer. I agreed enthusiastically. I followed my teacher’s suggestion to go to the residence for a practice session on the piano a few days before the recital. Once there, I sat at the piano but soon became very, very nervous. Mentally I said: “Lord Jesus, please help me.” A few moments later a little boy came to me. The janitor asked me if he was bothering me and I said “No”. I asked the small boy his name and how old he was. He answered that his name was Guillaume and that he was four years old. I found this very strange because my younger son had the same age and name. I remember that we played the piano together for a while and that I felt more calm. I suddenly realized that the little boy had left without me being conscious of his departure. It seems he came just to calm me down. Was it a coincidence or the Lord Jesus intervened? (2) During the 2001 winter, at the Trois-Pistoles food market, I saw a nice-looking man, quite tall, with black hair and a beard, wearing a long beige coat and a hat. That man passed by me, quickly nodding his head without saying a word. He looked happy and joyful, assured and confident. I did not respond because I was not able to remember if I knew him. On his part, he seemed to recognize me. I thought that maybe he was one of my husband’s co-workers. A couple of minutes later, I saw him again, and again he greeted me in the same way and this time I nodded back. But I was still not able to remember who he was. Back at home, I thought that maybe he was Lord Maitreya. I looked at his picture and found a great likeness. This incident gave me a lot of courage and hope. Was this man really Maitreya? (3) The next week, at the same Trois-Pistoles food market, a small lively woman addressed me using sign language. She made a lot of signs trying to tell me that she thought that I was strong by showing me the large water bottle in my cart, and in fact, I had put that large water bottle in my cart all by myself. I don’t know sign language, so I tried to tell her that she was exaggerating a bit. She was adamant and continued to suggest that I was indeed very strong. I thanked her for her compliment. She nodded and moved on. After a while, it came to me that it was true that I was strong and that I had the tendency to underestimate myself. At the instant that I thought that this woman was maybe Maitreya, I saw her at the cashier counter discussing, by sign language, with other people. I thought “I am imagining… it is not possible….” But I am still thinking about that woman, so full of life. Can you tell me (1) if the woman was Maitreya and (2) if the water bottle had a symbolic meaning? A bronze statue of the Madonna in a Catholic church in Hobbs, New Mexico, began weeping tears during Sunday Mass on 20 May 2018. A parishioner of the church, Laura Cisneros, noticed something unusual when she and her family attended the noon Mass at Our Lady of Guadalupe Catholic Church. “I turned to my husband and asked him, ‘Does the Virgin Mary have tears?’” she said. Her husband at first believed it was a reflection of light, but later could see the tears for himself. When he took communion and walked near the statue, he was convinced “a miracle was taking place”. So many visitors have come to Our Lady of Guadalupe to witness the phenomenon that local church officials decided to keep the church open 24 hours a day to accommodate them. Witnesses reported that the tears had the scent of roses and an oily texture. Initially, the statue was ‘crying’ so much that tears formed a puddle at the base. This latest book from the well-known journalist and activist Naomi Klein is a call to action to all who view with horror the pervasive greed and corruption of our rulers, and humanity’s blind neglect of our planet. Writing as an American-Canadian, Klein reveals in specifics the enormity of the corruption of the Trump administration, and at the same time offers hope for change. She also shows how (from the esoteric point of view) the Sword of Cleavage is doing its work; the ‘shock’ that so many feel at President Trump’s election and administration is countered by a long-standing opposing story: “that money is not all that is valuable, and that all of our fates are intertwined with one another and with the health of the natural world.” Resistance and protest are not enough – “not just saying no. We have to do that of course. We also need to fiercely protect some space to dream and plan for a better world. This isn’t an indulgence. It’s an essential part of how we defeat Trumpism”. The book concludes with a postscript: ‘The Leap Manifesto. A Call for a Canada Based on Caring for the Earth and One Another’. The manifesto came out of a multi-movement gathering in Toronto in 2015, particularly concerned with inequality and the degradation of the planet. Its aim was unity across peoples, movements and issues to produce ideas for a new way of living: to replace “an economy built on destruction with an economy built on love”. In our troubling times this (easy-to-read) book offers inspiration and hope. Pollution has become an everyday affair; a murderous way of life which, according to an article published in The Lancet (19 October 2017), is responsible for the deaths of at least nine million people every year. The air we breathe is poisoned, the streams, rivers, lakes and oceans are filthy – some more, some less – the land littered with waste, the soil toxic. Neglect, complacency and exploitation characterize the attitude of governments, corporations and far too many individuals towards the life of the planet and its rich interwoven ecological systems. The Lancet Commission on Pollution and Health, which is yet another cry for urgent collective action, found that pollution is responsible for a range of diseases that “kill one in every six people around the world”. This figure, while shocking, is probably a good deal higher because “the impact of many pollutants is poorly understood”. The landmark study states that we have reached the point when “deaths attributed to pollution are triple those from AIDS, malaria and tuberculosis combined”. Our selfish materialistic way of life is having a devastating impact on all forms of life; unless there is a major shift in attitudes the numbers of people dying as a result of toxic levels of pollution will rise; contamination of the oceans will increase, deforestation and desertification will continue, and the steady destruction of all that is beautiful and naturally given will intensify, until, one day in our paradise, all colour, diversity and light will be eradicated from this glorious world of ours, and it will be too late. Plastic waste is produced everywhere, but five Asian countries produce 60 per cent of the global total, currently 300 million tons (only 10 per cent is recycled): China, Indonesia, the Philippines, Thailand and Vietnam. If nothing changes it’s predicted that by 2025, plastic consumption in Asia alone could increase by 80 per cent to over 200 million tons, and global consumption could reach 400 million tons. Greenpeace estimate that roughly 10 per cent, or 12.7 million tons (that’s a lorry load of rubbish a minute) of all plastic ends up in the oceans of the world, where it is thought to kill over a million seabirds and 100,000 marine mammals. • 5,000 people die every day through drinking unclean water. • About 80 per cent of landfill items could be recycled. • 65 per cent of deaths in Asia and 25 per cent in India are due to air pollution. • Chronic obstructive respiratory disease (caused by burning fossil fuels indoors) is responsible for the death of more than 1 million people annually. • Over 3 million children under five die annually from environmental factors. • Worldwide, 13,000-15,000 pieces of plastic are dumped into the ocean every day. • At least two-thirds of the world’s fish stocks suffer from plastic ingestion. • For every 1 million tons of oil shipped, approximately 1 ton is wasted through spillage. • A million plastic bottles are sold worldwide every minute; and forecast to increase by 20 per cent by 2021. • Around 1,000 children die in India annually due to diseases caused by polluted water. • There are more than 500 million cars in the world; there could be 1 billion by 2030. • Shoppers worldwide use approximately 500 billion single-use plastic bags annually. This translates to about a million bags every minute and the number is rising. Pollution and the environmental catastrophe more broadly is the result of insatiable consumerism, selfishness and individual and collective irresponsibility. It flows from a materialistic approach to living, rooted in desire and an unjust economic system that demands unbridled consumerism for its survival. Excess and greed is encouraged, sufficiency dismissed. Corporate governments imprisoned in nationalism and obsessed with short-term economic growth feed the system, and the most important issue of the time is relegated to an afterthought, rarely spoken about by irresponsible, ambitious politicians who seem to believe that limitless development and mass consumerism is of greater importance than the health of the planet. Dr David Clarke is a principal lecturer in journalism and a scholar of folklore and mythology at Sheffield Hallam University, UK. He has also been involved for more than 20 years in studying and writing about the UFO phenomenon in the UK, with special focus on its cultural and sociological ramifications. When Britain’s Freedom of Information Act (FOI) came into force in 2005, Dr Clarke was one of the first to pepper the Ministry of Defense (MoD) with requests that it make the investigative files from its secret division known as the “UFO Desk” available for academic researchers. In 2007 the MoD announced it was preparing to declassify more than 11,000 files amassed since the 1940s and make them available to the public via the UK’s National Archives. The Archives invited Dr Clarke to be a consultant and curator for the project. During the monumental task of collating the material for release, he was particularly interested in the varied illustrations and artworks numerous witnesses created for their UFO sightings reports. That interest culminated in his new book: UFO Drawings From The National Archives. 1977: An object observed by a group of school children in the town of Macclesfield, England. After an introductory essay in which Clarke provides a history of the MoD’s involvement in collecting data on the UFO phenomenon, he presents an intriguing sampling of witness illustrations, arranged chronologically, that span five decades. The collection chronicles a historically increasing and colorful variety of UFO shapes and sizes, from crayon sketches by school children, to precise pencil drawings, to paintings and detailed diagrams (plus several photographs) – all with brief summaries of the reports they accompanied. I was particularly delighted by images from the 1940s and early 1950s which depicted craft that would not be captured by any photographers until almost a decade later – especially a bell-shaped craft that would later be dubbed the “Adamski saucer”, after George Adamski’s photos became widely seen. Many of the images in UFO drawings from the National Archives are wonderful. Some closely resemble objects that have appeared in photographs published in past issues of Share International that were confirmed by Benjamin Creme’s Master to be spaceships from other planets. A. I have said all along that the timing of Maitreya’s appearance is related to the state of expectancy in the public, which is of course the responsibility of those groups who believe in His presence. But it is not simply the ‘fault’ of the groups who are preparing the way for the actual appearance of Maitreya but all those groups working in the political, the economic, social, scientific fields; all have their own role to play in preparing for this event, whether they know it or not. The Master Djwhal Khul has written that those few individuals, not a lot of people but a sizeable enough group, whose task is to make the preparatory approach to the public, will have the most difficult task of all the groups, except the political groups. The political groups’ task is to create the conditions in which peace becomes effective; an internationalism should be created and evident – the creation of the United Nations is an aspect of this work, although it does not function very well. The principle of sharing is very far from dominating the present economic structure of the world. You could hardly say that our minds are moving even in that direction. So that is part of the preparation work. How much goodwill is there in the world? The principle, the energy of goodwill, has to be manifesting to make it possible for people to correctly respond to Maitreya’s advice. We all know people of goodwill but these are the people we have contact with. There are the millions who do not have goodwill. People tend to judge the state of the world on the basis of their own narrow field of relationships. All of these factors have to be taken into account by Maitreya in appearing before the world. It isn’t simply our task, although our task is very particular. But it is the task of the various groups, especially the economic groups, to change the situation so that when He speaks people will already be thinking in those terms. So it isn’t a question of groups like ours blaming themselves for not working hard enough. We need to see the bigger picture, that our work relates to the work of the other groups – the political, economic groups. The ideal way is to work steadily with a sense of urgency but without expectation; without every day watching for the result of what we do. So a steady drop of water on the stone eventually produces a hole in the stone. But if you’re looking at the stone every day to see the size of the hole you could be pretty miserable. Q. Why do some [other esoteric] groups not have a feeling of urgency about the Reappearance of Maitreya? A. One of the problems with certain groups is that they have no sense of urgency. Two major esoteric groups believe, from a misunderstanding of what the Master Djwhal Khul wrote, that Maitreya will not appear before 2025 or even 2050. And this even though in the last book He dictated, The Reappearance of the Christ, the Master DK states clearly that Maitreya will appear in a physical body in the middle of the 20th Century, around 1950, or towards its end. In the event it was 1977, which is towards the end of the century. Despite all this they still await Him in 2025 or 2050. Why? Because in the very first book, Initiation Human and Solar, the Master DK writes that we may look for the return of the Christ sometime around 2025 or 2050. That was the first book, written in 1919. Does that mean that those groups have read the first book but not the last book? There are 30 years between the first and the last book. The ideas and plans of Hierarchy change all the time in relation to changing conditions, of course. In the meantime, Maitreya announced in 1945 that He Himself would return at the earliest possible moment. It was hoped it would be around five years, 1950, the middle of the century, or later, if necessary. So, the information of the first book was changed over the 30 years to the new conditions around 1948 or 1949, when the last book was written, and it was possible to say Maitreya would appear towards the middle or end of the century. So, it was a completely new situation. Why do these groups believe the information given in the first book written in 1919, but ignore the information given in the last book, written in 1949? There can only be one answer – their glamour. It is their glamour that makes them look at and accept the earlier date rather than the later date. It is all written by the same Master in the beginning of his programme of teaching and at the end of that programme of teaching – 30 years difference. By the same token, you can accept what I say or what my Master says when He says it is very soon; that it is really very soon; that it is urgent or very immediate. Or you can think He says it but it doesn’t really mean soon: you can think He means it will be 10 or 20 years still. It’s your choice. Your glamour allows you to make that choice, for or against. The result is that these groups have missed the opportunity of a particular kind of service in preparing the way for Maitreya. They still of course do useful work by making known the general information through the books. But as for the actual immediate events – they have missed the bus…. Bishop William Swing is the President and Founder of United Religions Initiative (URI), an interfaith, global network that engages people from different religions and indigenous traditions to work co-operatively for justice and peace. Bishop Swing is the former Episcopal Bishop of California, a position he held from 1980 until 2006. As Bishop he served as a leader in response to the AIDS crisis, both nationally and internationally, having served on the board of the American Foundation for AIDS Research for nearly two decades. Bishop Swing is the author of A Bishop’s Quest: Founding a United Religions (2015). McNair Ezzard interviewed him for Share International. Share International: What is the mission of United Religions Initiative? William Swing: URI is an organization made up of grassroots people from about 270 religions and 75 to 85 tribal groups around the world who come together to work on issues in a local community or to address a global issue. The people come together in Cooperation Circles and each Circle decides its own destiny. They can organize around any issue they want as long as it’s in keeping with the preamble, purpose and principles of URI. A Cooperation Circle has to have at least seven people from three different traditions. URI is a bridge-building organization. There are enough religions in the world, but there isn’t enough communication or bridges between them. So if we could stop killing each other and competing against each other all the time, maybe we could do some things together in the name of God. SI: What was your inspiration behind the formation of URI? WS: As Bishop of California, I received a telephone call in 1993 from the United Nations. They wanted to come to San Francisco to celebrate their 50th anniversary. The Charter of the United Nations was written and signed in San Francisco by all countries. The nations have gotten together every day for 50 years and struggled for the global good. During those same 50 years the religions of the world haven’t spoken to each other. But peace among nations won’t happen without peace among religions. And there will never be peace among religions until someone creates a level playing field where they can meet each other. That night I committed the rest of my life to being a catalyst for the creation of United Religions, figuring if there’s a United Nations, there could be United Religions. I didn’t know what it would look like. I didn’t know what it would do, didn’t know how to get there or know how to pay for it. I was just one single person with this idea. SI: What were the next steps in getting it started and getting people on board? I learned a lot. The religions of the world were not going to meet and would not stay in contact with each other. But I believed that if we could find a vehicle that allowed grassroots people to meet each other and address local issues, it could make the world more peaceful and healthier. There’s a lot of goodwill among people in all religions. I gave up on religious leaders and decided to start with grassroots people. That was a turning point. SI: What was behind the religious leaders’ reluctance to do anything? WS: If you look at a religion, it’s like a triangle. At the top there is someone whose first responsibility is to defend the faith of the people underneath them. If they’re caught meeting with religious leaders of other faiths as equals, it kind of implies that their relation with God is on a par with the other person’s relation with God. As a religious leader you don’t have any latitude to meet with other people and treat them as equals. You have to treat them on the basis of “Our faith is the best faith. It has the most truth of all faiths”. Therefore, a democratic, level playing field of any sort is impossible for people at the top of religions. I love the people I met. They are terrific people, but they have very little freedom. I remember being in Jerusalem. The Dalai Lama and I were putting on a conference. He and I went to see the Armenian Orthodox Patriarch. He was up on a throne and the Dalai Lama and I were down on the floor and I said, “You know, the possibility of religions working together for the good of the world has all kinds of potential. Can you help us out?” The Patriarch said, “Look, I’m a prisoner on my own throne. I can’t leave this throne. You guys can go around the world, but I can’t. My job is to sit here on this throne and take care of my people.” That was a good example of what I’m talking about. SI: Being rejected by the religious leaders actually led you to find the people who really make a difference in the world. WS: Yes. The everyday person can be mobilized. Then you have real power in the world. That’s very encouraging. SI: Tell me about the Cooperation Circles. WS: In the year 2000, we signed the Charter [for URI]. We started out with our first Cooperation Circle in one country. The last country we went into was Saudi Arabia. We never thought we’d get in there, but now we have Sunni, Shia and Christian people working together in Saudi Arabia, which is miraculous! As I mentioned, a Cooperation Circle has to have at least seven people from three different traditions. They self-organize and off they go. SI: Are there Cooperation Circles that you find particularly inspiring? WS: One that got to me recently is in Sri Lanka. The Cooperation Circle is called Sarvodaya. They operate as a safety net under society. If you’re dealing with AIDS, they’ll work on it. If you’re dealing with poverty, they’ll work on it. If it’s literacy, they’ll work on it. Recently, a Buddhist truck driver was beaten to death by three Muslim kids. This is a Buddhist country. The Buddhists went crazy and started burning down village after village, burning mosques, killing the people, driving them from their homes. All of a sudden you have displacement and destruction. Who does anything about that? Our group began figuring out how to get water and food to people, how to begin rebuilding their houses and mosques. This situation was in the wake of the civil war between the Tamil Tigers [largely Hindu minority] and Sinhalese [largely Buddhist majority], where many people were killed. Our Cooperation Circle works to heal the country and put the pieces back together. In West Africa where the Ebola virus started out last time, Christians didn’t want to give their blood to Muslims. Muslims didn’t want to give their blood to Christians. So a Cooperation Circle of URI started a blind trust blood bank, where everybody in the community could get blood and give blood. It helped stabilize the community by doing interfaith blood donations. Since October 2016, the Rwandan government has been using a drone delivery system called Zipline to transport blood products and medicines to 21 transfusing facilities in the country. Hospitals used to take many hours to pick up blood at a regional center, but now blood is delivered directly by drones to the facility. The service is able to make 500 deliveries in 24 hours, day and night, and the average delivery time, after a text message request, is 30 minutes. Ultimately, Rwanda’s vision is to put all 12 million citizens within 30 minutes of any essential medical products. Each electric-powered Zip (drone) weighs about 22 pounds, can carry around three pounds of medicine, and can travel for more than 75 miles on a single battery charge. The drones use GPS (Global Positioning System) and Rwanda’s cellular network to navigate, and deliver blood or medicine in cardboard boxes that are dropped with a parachute from low altitudes. Delivering the packages within 30 minutes eliminates the need for onboard insulation or refrigeration, and the Zips are durable enough to withstand rain and wind. The vehicles were developed by engineers who had previously worked at organizations like Boeing, SpaceX, and NASA. 5 Our New, Happy Life?